CLICK HERE FOR ORIGINAL ARTICLE IN THE NATIONAL INTEREST. On February 29, a bipartisan group in Congress expressed concern about the State Department’s terrorist classification of an Iranian dissident organization—the Mujahedeen-e-Khalq (MeK)—and about a number of its members currently under siege in Iraq. In response, Secretary of State Hillary Clinton announced that Washington would help ensure the security of the dissidents as they relocate to another Iraqi camp. She also leveraged the MeK’s desire to be removed from the U.S. list of terrorist organizations, stating that the MeK’s cooperation in the American-backed relocation plan“will be a key factor in any decision” to delist it. In doing so, Clinton accepted that the U.S. has a responsibility to protect the dissidents and implicitly acknowledged the lack of evidence that the MeK engages in terrorism. After the American-led takedown of Saddam Hussein, Washington found Iranian dissidents in Camp Ashraf, Iraq. Washington recognized them as “protected persons” under the Fourth Geneva Convention, which imposes conditions on the transfer and dispersal of protected persons. After the 2011 withdrawal of American forces, Iraq assumed the obligation of protecting these MeK members according to humanitarian law and the Convention Against Torture of 1984, which Baghdad signed. But Iraq is beholden to Iran. Rather than protect the Iranian oppositionists, Iraqi security forces have harassed and attacked them. They have threatened to transfer MeK leaders to Iran, where they have a reasonable fear of persecution. Such intimidation may be psychological torture contrary to the Convention Against Torture. UN Secretary General Ban Ki-moon popularized the “responsibility to protect” unarmed civilians subject to harm by well-armed states. The responsibility to protect principle (R2P) holds nations responsible for shielding civilians in their midst from war crimes, ethnic cleansing, and related crimes against humanity. According to the secretary general, the doctrine “requires the international community to step in if this obligation is not met.” Washington is now stepping up to the plate with its offer to protect the Iranian dissidents in Iraq. But others have shirked their roles in monitoring the situation. The International Committee of the Red Cross (ICRC) acknowledged it has not visited the Iranian oppositionists as of the end of 2011 because “the situation . . . is being monitored by the United Nations Assistance Mission for Iraq [UNAMI].” Yet monitoring by UNAMI has not restrained Iraqi military and police forces. 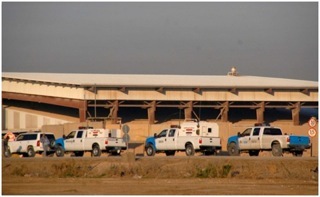 They violated a signed December 2011 memorandum of understandingbetween the UN and Government of Iraq by mistreating Iranian dissidents during their transfer from Camp Ashraf to Camp Hurriya, formerly Camp Liberty, Iraq. The International Committee of Jurists in Defense of Ashraf (ICJDA) reported that Camp Hurriya “is indeed a prison,” with scores of police throughout the camp, which is less than half a square kilometer. Residents must be accompanied by the police even when going to the dining hall. The IDJCA report suggests that a UN statement in January 2012 claiming the infrastructure of Camp Hurriya accords with international humanitarian standards is false. Ambassador Martin Kobler, the head of UNAMI, was present when some four hundred members of the MeK arrived at the new location in February. He congratulated “the Iraqi authorities for having ensured a safe and secure relocation of the first group of residents.” Kobler’s observation flies in the face of realities on the ground and is inconsistent with obligations to ensure the safety of civilians. In changing course on the MeK, U.S. policy makers should encourage three steps. First, Washington must close the gap between acknowledging the responsibility to protect and implementing it in Iraq. Clinton’s statement to MeK supporters in Congress is a good first step. Designated protectors—Baghdad and UNAMI—are unwilling to meet humanitarian standards; Washington’s pledge to ensure the security of dissidents as they move to another site inside Iraq is well-advised, but treatment in the new site is as important as safety en route. Given Iraq’s prior violence against the dissidents and the lack of freedom in the new location—there is even less freedom at the new camp, Camp Hurriya, than there was at Camp Ashraf—it is crucial that U.S. leverage continues to protect the Iranians even after they arrive. Second, the ICRC and other monitoring agents must become more involved. The ICRC can’t simply defer to UNAMI, which has abdicated its responsibilities in favor of maintaining good relations with Baghdad. The ICRC oversees whether nations are complying with the Geneva treaties and repeatedly has urged Iraq to treat the dissidents with dignity. If Amnesty International, independent fact-finding groups, and parliamentary delegations were allowed to visit the new facility, they could act as watchful eyes of the international community. Without such monitoring, Baghdad’s April 30 deadline for residents to vacate Camp Ashraf or accept responsibility for forcible closure foreshadows a repeat of last April’s Iraqi attack on the unarmed civilians of Ashraf. Third, rather than deferring to UNAMI, the United Nations High Commissioner for Refugees (UNHCR) should accelerate resettlement outside Iraq, e.g., just across the border in Jordan, a location where the Iranian oppositionists agreed to move temporarily. The secretary general must coordinate these UN bodies so they fulfill the R2P principle for unarmed civilian dissidents exposed to a regime under the sway of another neighbor to the east—the Islamic Republic of Iran—which seeks to destroy those who reject clerical rule. Ensuring that Iranian dissidents receive Geneva-convention protections is in the U.S. national interest—and Washington’s envoys should make sure that the Iranian dissidents are not another casualty of the fragile situation left behind in Iraq. Raymond Tanter served on the senior staff of the National Security Council and as personal representative of the secretary of defense to arms-control talks in Europe in the Reagan-Bush administration.